Sprouts contain an amazing amount of nutrients compared to dried seeds. 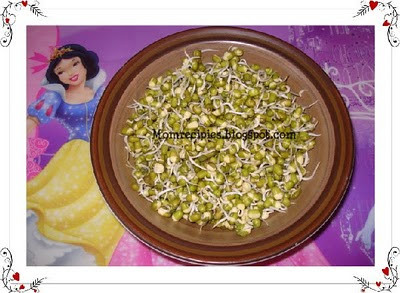 Sprouting increases the vitamins, minerals and protein and decreases the calories and carbohydrate contents.Sprouts also contain large amounts of plant oestrogen. They increase bone formation and density and prevent bone breakdown, or osteoporosis. They are also helpful in controlling hot flashes, menopause.Sprouts are amazing cancer fighters.Moong Beans /Green Gram are the easiest to sprout.They have a fresh flavor and are very nutritious and healthy. They are fairly large, with crunchy texture and a delicate flavor. 1) Soak Whole Green Gram / Whole moong over night. Next morning drain the water and tie them in a dry muslin cloth and place in a warm place (or in the oven) for 1 day without opening the cloth. In 1 day small shoots come out and good sprouts are ready. 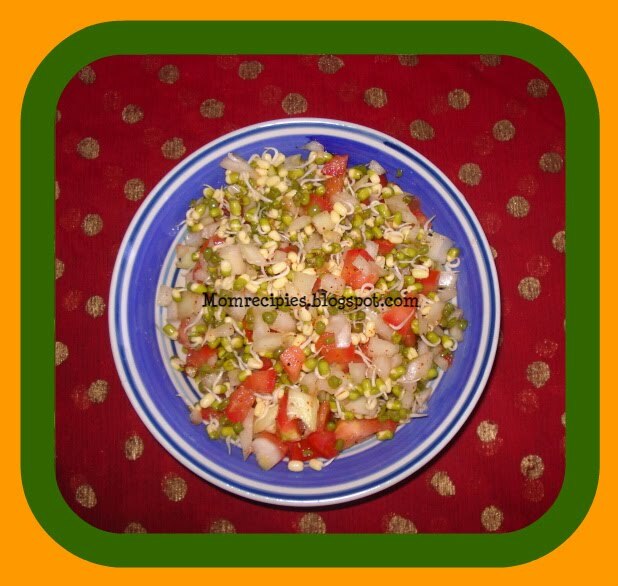 2) Cut onion, cucumber, tomato into small pieces . 3) Chop Green Chilli and coriander. 4) In a bowl mix all the pieces with sprouts. 5) Add pepper powder,chilli powder and salt to taste.Add few drops of lime juice. 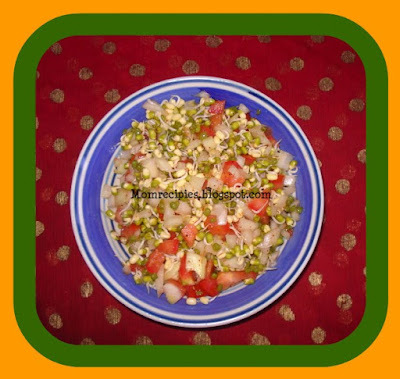 6) Mix well and have the healthy refreshing salad. Eat it as a snack or breakfast. You can vary the quantity of the ingredients according to your liking. You can also add carrot , raw mango ,capsicum etc.